Today we are featuring another fabulous tutorial from my dear friend Erin's blog, Lovesome. Go visit her and see all the other amazing things she is dreaming up! It seems bow ties have taken over the wardrobes of men, babies, and boys these days, doesn't it? I must admit this trend has been a favorite of mine for quite some time now, and I love the pointed bow ties I'm seeing in all the old movies and shows I have been watching lately (downton abbey, anyone?). With all the bow ties I see all over blogs I thought it would be fun to switch it up a bit and try something different. Enter: the pointed bow tie. It often gets forgotten, and I think it's a great nod to men's (and boys') fashion from decades and even centuries ago. Making it out of felt not only makes these babies a breeze to whip up, but it also modernizes and adds a touch of whimsy, not to mention makes these the perfect fall accessory for the guy in your life (or girl, I would wear it too, and it would make an adorable hair bow). 1. cut one end of the longer felt strip into a point. lay the felt strip on a flat surface and bring the pointed side across the strip about 2/3 of the way. 2. turn the pointed side over and bring it back across the other side until it touches the edge. 3. adjust the point if you need to, it can touch the edge or hang over a bit, whatever you like. 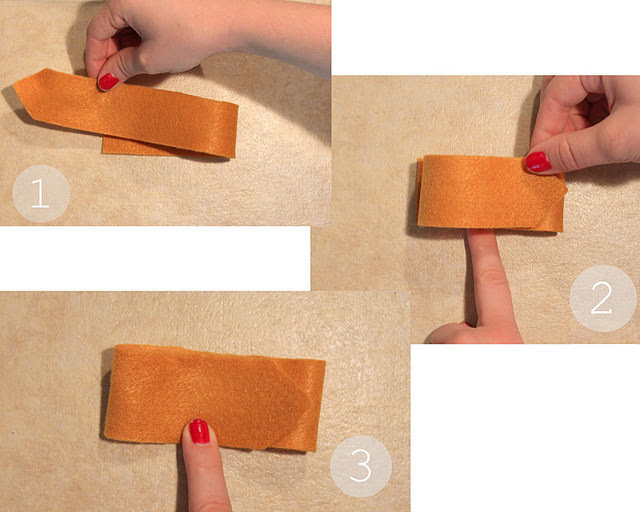 4. scrunch the middle of the felt together, making it look like a bow. 5. wrap the smaller felt piece around the middle of the bow where you scrunched it, with the ends meeting in the back. 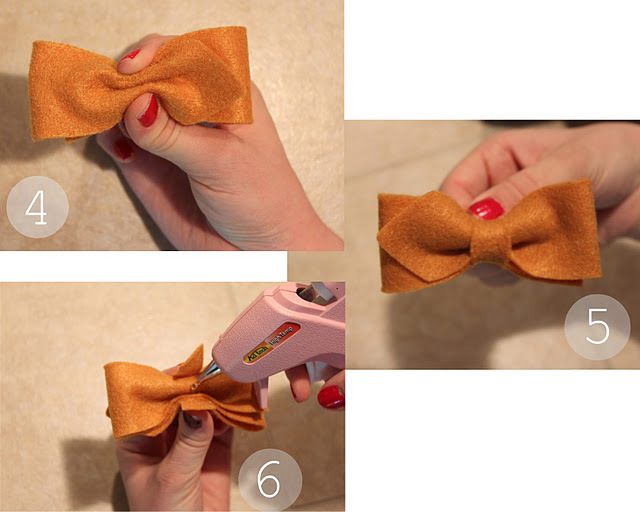 6. turn the bow around and dab some hot glue in the center of the bow, then fold the top end down over the glue. glue down the remaining flap, making sure the bow is tight and secure. and then have fun with them! To turn it into a bow tie I usually thread elastic through the center of the back of the bow tie, but if you don't have room you could glue elastic to it or sew/glue it to a pin or clip. I really want to do this for my son next week for his naming ceremony, but I'm thinking he'll spit up on it after about 3 seconds! So cute :) I just made my son a bow tie a couple days ago! Love this! I can't sew but I do love a good glue gun project! So cute! I have 4 friends who are pregnant right ow and after so many girls, including my own 2, I hope there is a boy coming so I can make these! !